With so many new startups making toddler trays for travel and over a dozen available on Amazon. Many of them not very different than the next. We took the time to go thru and find the best children trays you should consider. If you’ve ever taken a long road trip with your baby, you’ve probably wished you had something to keep the little one occupied. We reviewed some of the best car seat travel tray on the market below. So you can make an informed decision. Dmoose has the best selling travel trays to date and for a good reason. With a 4 inch wall almost all the way around and many straps to safely keep toys in. We found that the base to be sturdy but forgiving keeping your little one safe. 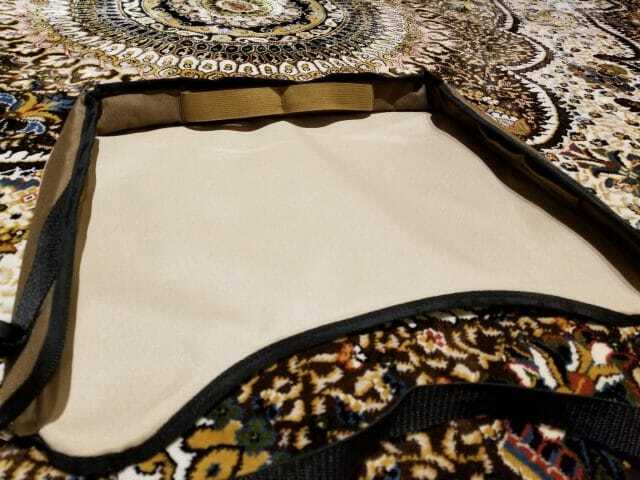 The material is a nice beige polyester and pearl wool for easy cleaning and waterproof surface. Since first reviewing this tray, Dmoose went out and created a version 2 but we still prefer the original over it. In their updated tray, they improved the stability of the tray and added mesh pockets. Dmoose offers travel trays in 7 colors, the most! And we love it. ORGANIZED EMPIRE delivers when it comes to a travel tray. This unique travel tray transforms into a bag, detaches in the car to become a separate travel tray, organizer and tablet holder. We love this travel tray. We love that this backseat tray easily transforms into a bag, keeping all the contents inside and back into the house. With clear PVC cover, any car transforms into a backseat media player. 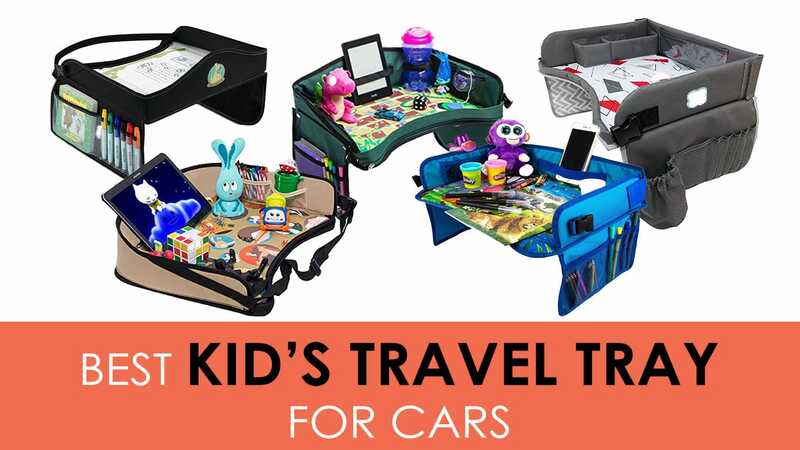 If you have a child older than 1, we recommend this portable car tray. We would have loved if they had more colors available. 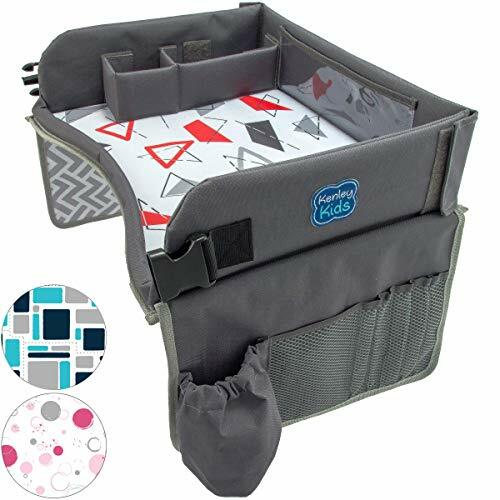 Kenley Kids travel tray has sturdy tall walls, we love that the walls can collapse as they are in place via velcro. We love all the pockets. Kenley travel tray is one of the few that provides padding on the straps that around your kid. A few things we would like to see changed is the velcro stability piece, we do realize what it’s for but let’s face it, most parents will lose this piece. We liked that the tablet holder is see through but they do still have a bezel. The MC Republic makes a great travel tray for any kid. The tray’s side walls are tall and sturdy, the base features a removable front edge that stops anything from rolling off the tray. We love that this tray has one of the highest walls, we love that it comes with a game board ready to play. We also love that the side mesh pockets are removable. We would love if Republic had colors for parents that don’t want bright green for their little one. This toddler tray features a padded frame made with honeycomb-like material. The side walls are a good height and fairly study. This is a newer company in this market and we would have liked to see a tablet holder. We did like the removable mesh pockets and with a bonus coloring set, we believe this will make any parent happy. ModFamily E-Z Tray is safe and sturdy. It can be worn as a backpack with a variety of places for storage, it even comes with two removable mesh pockets. We really that ModFamily kept it simple and easy to use, but the fact that the tray walls are not sturdy or high enough took points away from being a real contender. We also did not like the position of the cup holder. We did really like the price point and think it’s perfect for the budget parent. A car seat activity tray need to have a sturdy base so kids can enjoy their activities without the base drooping. The base should be sturdy during activities but be forgiving during an accident. The materials need to have the perfect trade-off, as safety is any parents first priority. Some trays have cup holders in the middle or at the corner of the base. While this is a logical place to put a cup holder, we found that many toddlers complained once a full cup’s weight was on their legs. Parents also found their kids were more likely to sit crooked as having a cup resting their leg was unconformable. We prefer a flat base with attachments coming in off the reinforced sidewalls or against the outside of the base. 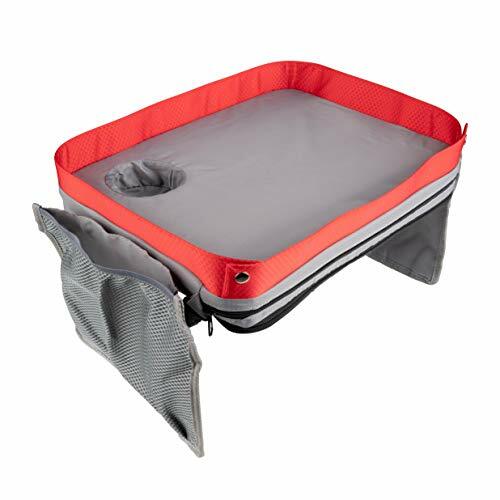 Sturdy and high walls are a must in travel tray for carseat. If crayons and toys are falling off the tray at every turn, the product fails to make the life of parents easier and annoys children. Many lap trays do not offer reinforced walls, while others have the walls so low it fails to do what it was designed for. Think of the base as a home and the walls the fence. We all know kids can be messy eaters. Every tray should be made of a composite material that is easy to clean and sturdy for the abuse an upset child can throw at it. It should be tear proof while at the same time being comfortable and safe for your sweetheart. As a parent, you want the best for your child and with many companies selling toddler travel tray they should be offering the best. Keeping a child safe is an everyday matter. Every parent knows the risk of driving and we don’t ever want to think about a scenario that involves our little one but we have to be prepared. The biggest advantage of these trays is it keeps our babies occupied so we can keep our attention focused on the road, but if anything did happen. This car tray for toddlers cannot prohibit or get in the way of built-in safety features in the car and car seat. A kids travel tray provides a flat contained surface for children to occupy themselves with any activity. If a child wants to color, read or play with toys a sturdy flat surface is ideal. During a long road trip or a short drive around the block, some kids need activities to keep them busy while the caretaker safely drives. 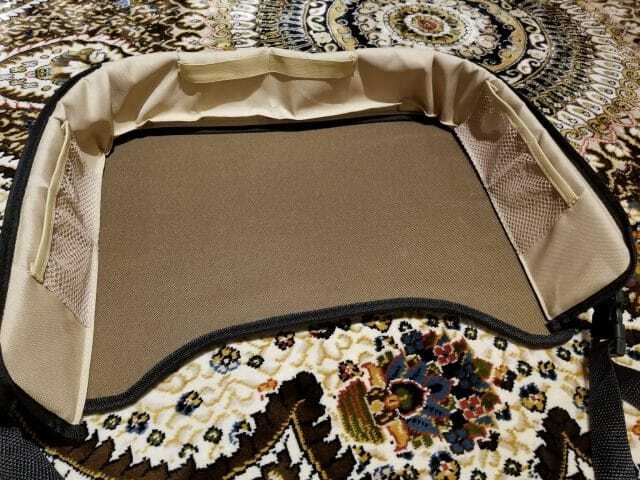 Travel tray for car seats, much like the name suggests are designed to be used in vehicles. They are soft yet sturdy, hard yet brittle in an accident. 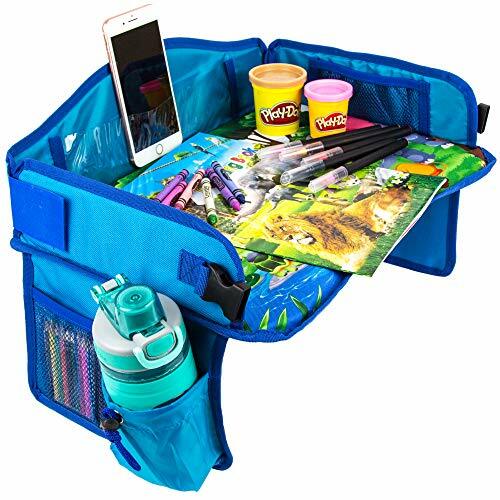 The best car seat activity tray offer a wide range of features, from easy to clean, perfect size, many compartments, drink holder, a tall wall for items not to fall off, and easy to transport and store. We look at the different types of trays available, the pros and cons to each so you can make the best choice for your kids car tray and your needs. Thanks for reading through this short little review about the best kids travel tray . Leave a comment if you have any questions or check out our most recent posts below. 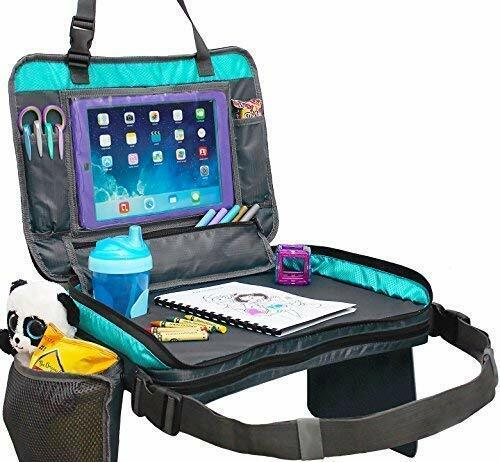 The Baby Seater is designed with a clear plastic top layer so kids can color and draw on the tray. The tray comes with side pickets designed for wet wipes. This simple design is elegant yet small when compared to DMoose TT-1. We would have liked to see sturdier and taller walls around the tray and pockets inside the tray. includes 6 dry erase markers and drawing activities putting it in a solid 4th best travel tray. Last but not least, we have Star Kids Snack and Play Travel Tray. If you want basic and original, the star kids travel tray is it. It’s the most widely sold tray, one of the most popular and well-known trays as well. It features a reinforced wall, a cup holder, and mesh pockets. It’s made out of nylon and features a one size fits all design. Now we can talk about what’s wrong with the Star Kids tray but it wouldn’t be fair as most other trays are based on this original design. The competition has caught up, they offer a better design, more features and are sturdier. But we needed to include them as an honorable mention. Thanks for reading our review of the best car seat travel tray. See our reviews like best baby activity center and best diaper rash cream. 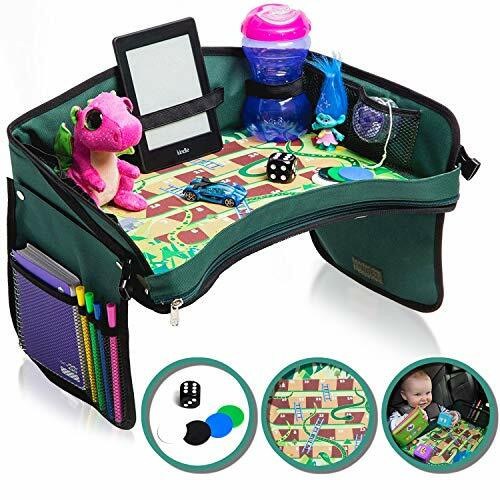 You caught me when you said that we should be keeping our toddles preoccupied while traveling by providing them some travel tray bags to carry and play into. We surely don’t want them crying and shouting for your attention while driving so keeping himself busy while driving on your way to your destination is a brilliant idea. I personally like the 6th tray bag you’ve shared that has a clear plastic top layer so they can draw and erase it with free side pickets for wet wipes. My 3-year old daughter Stephanie is fond of drawing and coloring so I bet she’s going to love this if we’re heading outdoors for camping. I’ll have to look around and see these travel trays for myself so I can secure one for her when we’re out.